The Global Volcanism Program has no activity reports for Butajiri-Silti Field. The Global Volcanism Program has no Weekly Reports available for Butajiri-Silti Field. The Global Volcanism Program has no Bulletin Reports available for Butajiri-Silti Field. The Butajiri-Silti volcanic field consists of a large group of basaltic cinder cones, maars, and lava flows in an 80-km-long, NE-SW-trending area near the west margin of the Ethiopian Rift. At least 13 maars, many filled by lakes, are located near the town of Debre Zeit, SE of the capital city of Addis Ababa. The maars were erupted through Pleistocene rhyolitic lava flows and tuffs. Eruptions of the younger basaltic cinder cones were contemporaneous with those that produced the maars. Some of the lava flows associated with the cinder cones are very young and are considered to be prehistorical in age (Di Paola, 1972). Emilia D A, Last B J, Wood C A, Dakin F M, 1976-77. 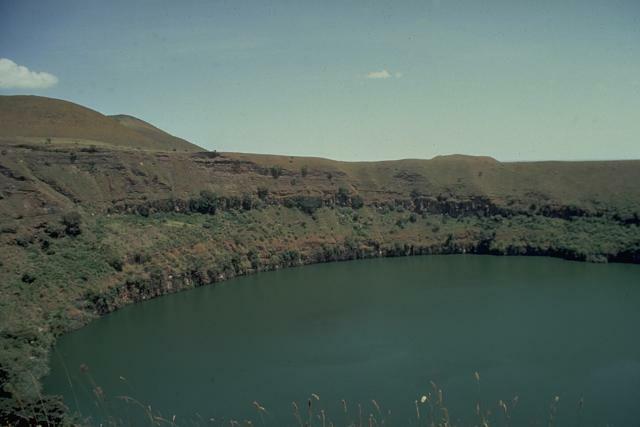 Geophysics and geology of an explosion crater in the Ethiopian Rift Valley. Bull Volcanol, 40: 133-140. The Global Volcanism Program is not aware of any Holocene eruptions from Butajiri-Silti Field. If this volcano has had large eruptions (VEI >= 4) prior to 10,000 years ago, information might be found on the Butajiri-Silti Field page in the LaMEVE (Large Magnitude Explosive Volcanic Eruptions) database, a part of the Volcano Global Risk Identification and Analysis Project (VOGRIPA). There is no Deformation History data available for Butajiri-Silti Field. There is no Emissions History data available for Butajiri-Silti Field. The 1-km-wide, lake-filled Ara-Shetan maar is located at the south end of the Butajiri-Silti volcanic field. It consists of a large group of basaltic cinder cones, maars, and lava flows in an 80-km-long, NE-SW-trending area near the west margin of the Ethiopian Rift. At least 13 maars, many filled by lakes, are located near the town of Debre Zeit, SE of Ethiopia's capital city, Addis Ababa. Eruption of basaltic cinder cones and associated youthful lava flows was contemporaneous with those that produced the maars. Photo by Giday Wolde-Gabriel (Los Alamos National Laboratory). There are no samples for Butajiri-Silti Field in the Smithsonian's NMNH Department of Mineral Sciences Rock and Ore collection. Large Eruptions of Butajiri-Silti Field Information about large Quaternary eruptions (VEI >= 4) is cataloged in the Large Magnitude Explosive Volcanic Eruptions (LaMEVE) database of the Volcano Global Risk Identification and Analysis Project (VOGRIPA).